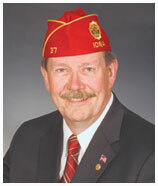 Needless to say, the American Legion is not, nor has it ever been, a terrorist organization. Until now and the Obama administration’s insistence that all groups on the right of their ideology are terror groups. It is too bad that these words will be falling on deaf ears. To the Obama Administration, any one who doesn’t fall in lock step behind him, must be eliminated, ridiculed and destroyed. Well said Commander Rehbein, well said!